The Easybond MKII unit is suitable for all types of minor installation and maintenance work. It is primarily for the occasional user who needs a simple, rugged and low cost machine. The unit is portable and easy to transport. The brazing process is controlled by means of the fuse wire on the brazing pin. 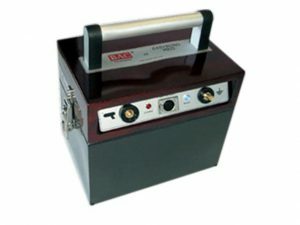 The capacity is up to 30 brazes with the smallest type of brazing pin, and it can easily be increased by a battery charger mounted in a vehicle, the batteries being charged during transportation between workplaces.